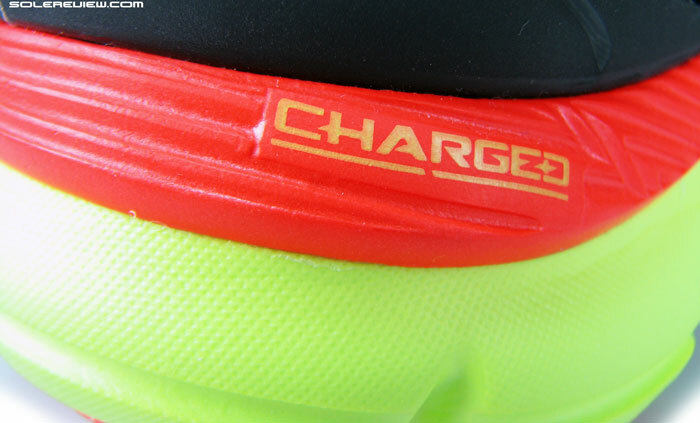 Under Armour's marketing pitch: 'Charged cushioning' delivers game changing impact protection and energy return. Upper: Soft mesh, urethane molding, Bemis tape, TPU toe and heel elements. The competant Speedform Gemini is proof that Under Armour is taking its foray into the running footwear business very, very seriously. This shoe is clearly a winner. None of significance. But we had to nitpick, then we'd say that the collar edges aren't comfortable for barefoot use, and there's too much upper pressure over the small toe. UA took a year after SF Apollo to release the Gemini, and it was worth the while. It is reassuring to see that Under Armour isn’t flooding the market with a slew of new releases. Last year, they released the lightweight Apollo, but did not immediately follow on with multiple spin-offs. Instead, the Baltimore based company chose to keep its cards close to their chest, and waited a full year before letting the Speedform Gemini loose. Not rushing things is a good approach; especially for a brand known more for its apparel than footwear. Better to go slow and steady rather than heading blindly into an unfamiliar area, because as far as running shoes are concerned, Under Armour is still in its freshman year. That approach has yielded a result worth the wait, and the superlative Speedform Gemini is a testament to that. The new Speedform Gemini builds on the best practices of the Apollo. The name: we had to ask, didn’t Apollo happen after the Gemini? The Speedform Gemini picks up where the Apollo left off, adopting the familiar Speedform silhouette and lines of the latter but with a number of new enhancements. We have a question about the naming convention, though. Assuming that Gemini and Apollo are obvious references to manned US spaceflight programs, shouldn’t the Apollo come later than the Gemini? From a timeline point of view, it was the Mercury-Gemini-Apollo. But we’re talking spaceships here, so perhaps this is a reverse countdown. In which case, perhaps the next UA shoe is called Mercury? Time will tell. 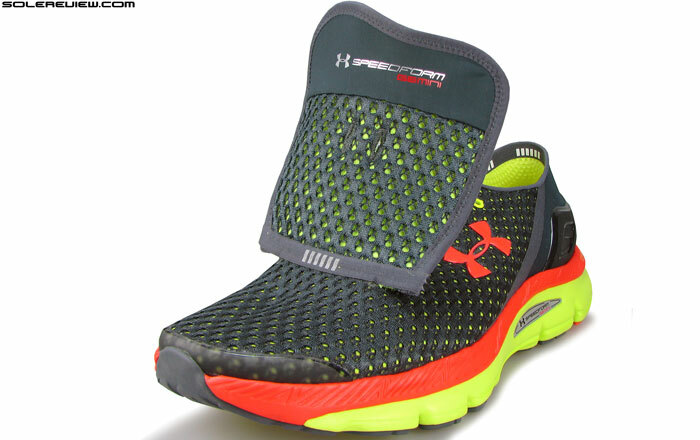 One of the other things we find likeable with Under Armour is that they’re focussing on neutral shoes instead of lateral expansion into motion control shoes, and that move appears to be intentional. There are interviews in which one of their execs is quoted saying (read last para of this) that the focus should be on injury prevention through physical conditioning than relying on motion control shoes, and we couldn’t agree more. 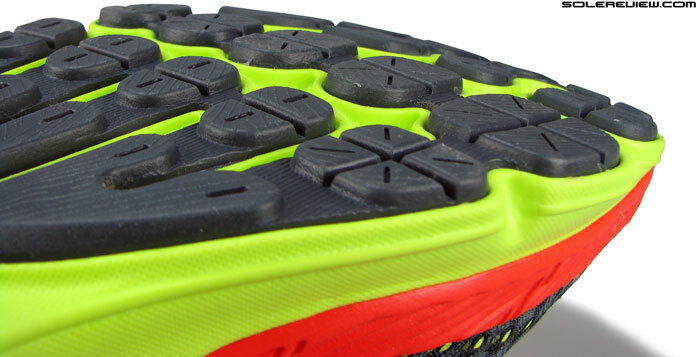 Unless one is switching from a 10 mm drop shoe to a Vibram overnight (which is a recipe for disaster), most shoes with a blend of cushioning and support will do if one is in great physical shape. This is Speedform Gemini’s secret sauce. 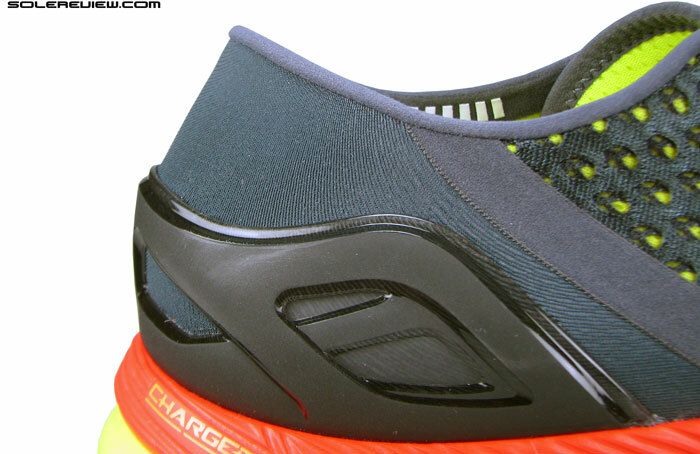 The new ‘charged’ midsole foam is the headlining act on the Speedform Gemini. Now the Gemini is not the replacement for the Apollo; rather it is a complement, offering a higher level of cushioning and outsole durability while maintaining design consistency. One area which immediately gets noticed is the Gemini’s weight. At 314 gms/11 Oz. (for US 11), it is substantially more bulkier than the Apollo, and majority of that difference owes itself to how the Gemini is designed. Midsole foam is the newly targeted territory which brands want to annex, and everyone’s trying really hard to make inroads into this crowded arena. Not many years ago, the crown jewel used to be a proprietary cushioning system embedded inside the midsole, and not the midsole foam itself. But things have changed of late, with Nike’s push with Lunarlon foam half a decade ago, adidas with Boost, Brooks with DNA, Saucony with Powergrid+, Hoka of course, and in 2015, Asics and Puma. Some of these introductions back up the lofty marketing claims, while others are damp squibs. 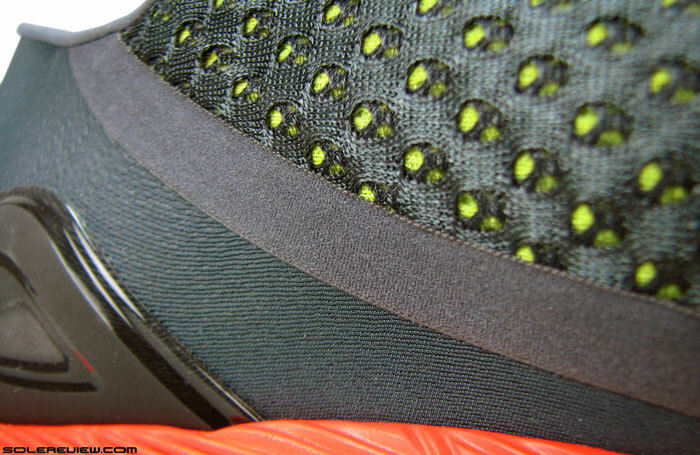 Midsole construction is pretty straightforward; two densities of foam in a stacked set-up. Speedform Gemini uses a dual stack of midsole foam, a thinner sheet glued on and interlocked with a larger volume base. 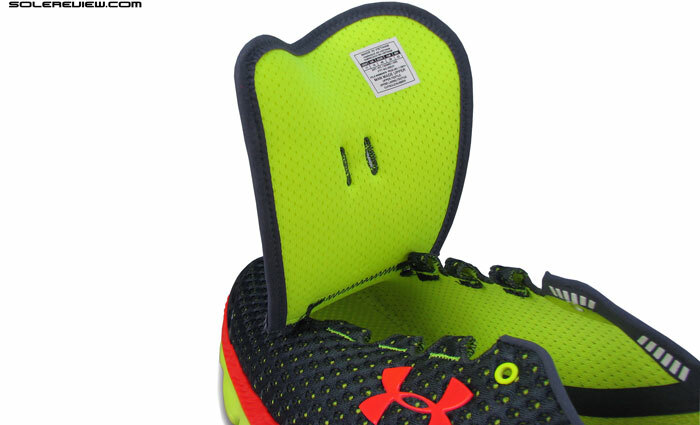 UA calls this ‘charged foam’, and we know not what this is made of. These days, it is hard to generalise foams as EVA (Ethylene Vinylene Acetate) anymore. 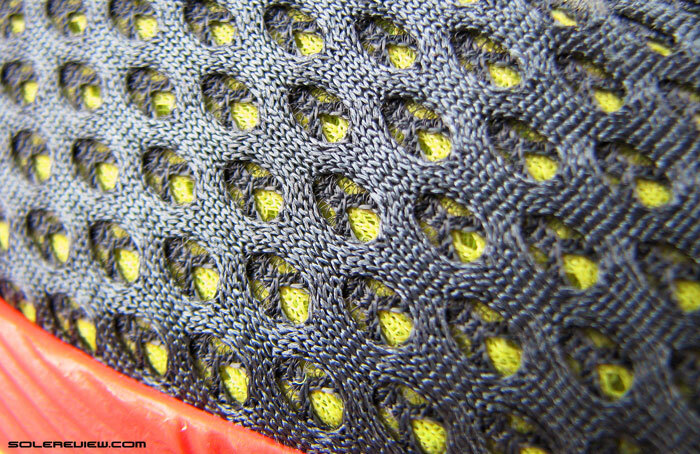 Most midsole foams are blends of multiple compounds, with the goal of offering enhanced ride characteristics. In Gemini’s case, the foam texture feels a bit rubbery, and is firm with a touch of resilience. 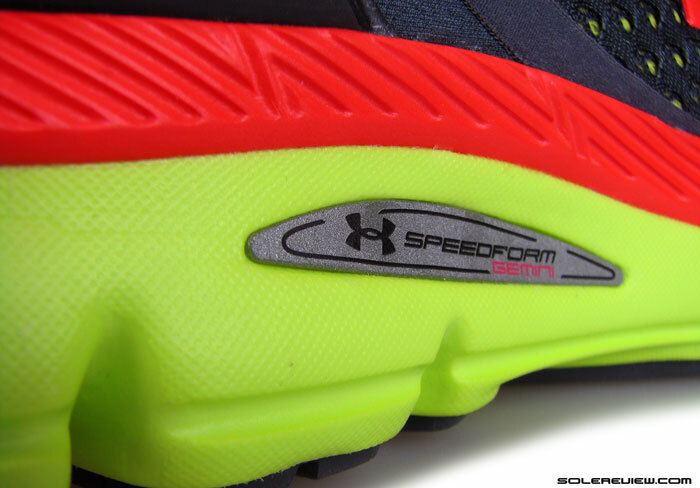 The Speedform G is cushioned, yet far from soft or mushy. There’s a resilient quality about its ride. When it comes to the actual level of cushioning and responsiveness, the Speedform Gemini is a bit measured, muted. The midsole cushioning is certainly adequate, and there’s responsiveness too, but it is almost if something is holding the two back. A curtail of cushioning, if you will. So it is not super soft or cushiony, and ditto goes for the responsiveness. The exposed area under the rearfoot results in a slight bit of trampolining effect. All of the above makes up for a great running experience. The midsole delivers a ride quality which is in the goldilocks zone of cushioned and firm, making the shoe feel very efficient. There are no mushy sink-in spots, nor a variation in cushioning feel for the most part. The underside of midsole heel is exposed, allowing for a minor amount of trampolining on rear-foot strike. Except for that, it is unadulterated cushioning consistency right from heel to toe. Heel has a beveled edge for better post-footstrike transitions. The segmented crash pad increases the range of motion for that area, spreading the footstrike impact area. Transitions are excellent on the Gemini. The ride is on the firmer side, outsole is pretty much full contact, and there aren’t many midsole parts to interrupt weight loading. Forefoot isn’t very flexible, has a touch of stiffness, and that’s something which works in your favor when doing pace runs. Heel has a minor angle of upward bevel, and the crash pad is segmented for gradual impacts. The Speedform Gemini is performance minus the fuss, drama or distraction. If you were expecting wow-evoking levels of soft cushioning and bouncy responsiveness, then this isn’t the shoe for you. The true character of the shoe only comes to the fore when you’re a few miles into your run; when you start appreciating the fact that softness and cushioning can be two different things. In Speedform Apollo tradition, the footbed is integrated into the shoe. No separate layer of insole, just some soft foam padding. We must point out that the Gemini would not make for a like to like comparison with most of other neutral shoes available. Because the shoe, like the Apollo before it, does not have a separate insole cupping your foot. And that makes all the difference. If you’ve run in the Apollo, or at least seen how the insides of the shoe looks like, then you know that the Speedform design’s claim to fame is its smooth heel lining. Meaning there is no independent footbed. Replacing that is a construction which allows the footbed fabric (from midfoot to heel) to extend upwards without seam, making the inside super smooth. The seamless heel cup is exactly what it is called; a smooth, friction free interior. 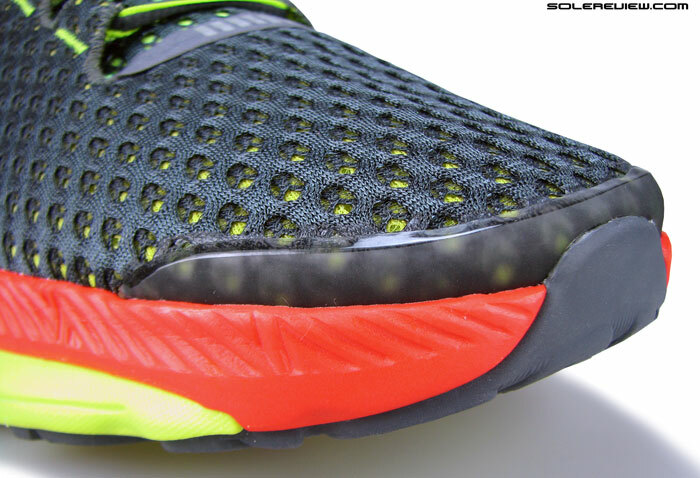 Use of no insole means that the foot directly rests on the midsole foam, kind of. In the Gemini, there is some foam between the footbed and midsole, but it is a very soft type, something regularly seen in collar and tongue fills. Something which makes not swing the needle as far as its contribution in the cushioning level is concerned. 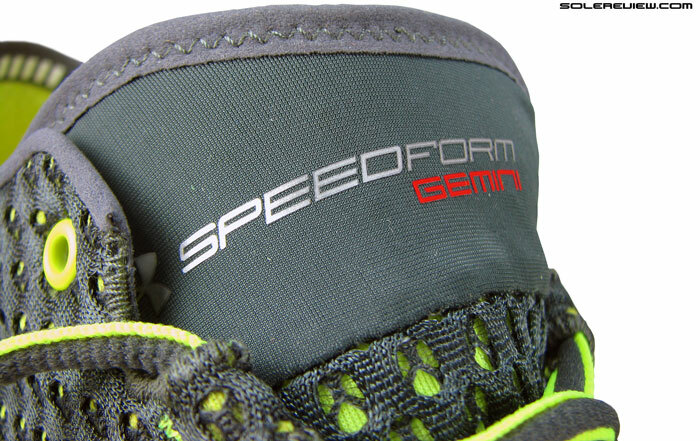 So what if the Speedform Gemini came with a separate insole? And from experience (read our Go Run 4 Ride and NB 980 review), we know that the insole does make a difference. So we pulled out a pair from the adidas Tempo 7 Boost and slid them inside the Speedform Gemini. What happens if you pop a Tempo 7 Boost insole into the Gemini? In stock form, the Speedform’s cushioning is firm and slightly responsive. As a benchmark, it could be described as being somewhere between a Kinvara 5 midsole and adidas Glide Boost – cushioning is there, but with firmness very much a part of it. And we think that’s purely because of a lack of an insole. We have been on that road before, with Skechers’ Go Run Ride – where the shoe feels completely different depending on whether you use the insole or not. Same thing with the New Balance 980, a review in which we experimented running in them without the insole. This way, we have a clear sense of how the stand-alone midsole performed. 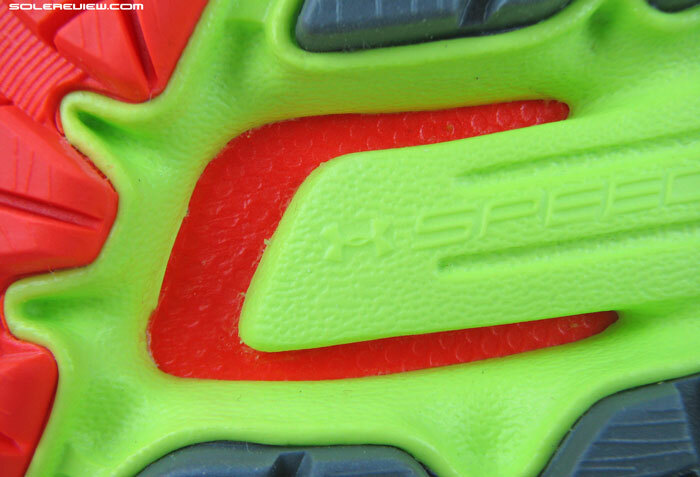 However, a hypothetical Speedform Gemini with a removable insole is a different beast altogether. And just how does that feel? The Gemini instantly transforms into a shoe which feels far more responsive and cushioned. If a runner was to be blindfolded (and somehow managed to run in a straight line) with the stock Gemini and insoled version one after another, he/she would have sworn these were two completely different models. What the insole does is to provide an immediate layer of padding underfoot, as compared to the deeply located midsole cushioning, which takes more time and load to unlock. The foam just below the footbed cloth makes little impact, and cannot replace the insole’s functionality. That said, in its default, super snug set-up, putting an aftermarket insole is not a practical solution. Sweeping changes would have to be made to add a few millimetres of material inside – something which only UA can do on a new model, that is if they choose to. Under Armour did say that the shoe is made in a bra factory. An insole,in that sense, would be the equivalent of a push-up bra. That digression nonetheless, personally we like the Speedform Gemini the way it is, minus the additional layer. There is too much softness going around in running shoes nowadays, and Under Armour does well here to disrupt the status quo. Full contact, built-up rubber outsole here. No wispy pieces of rubber as was seen on the Apollo. Layout might have familiar design traces of SF Apollo, but most areas are paved over with either carbon or blown rubber. And the lugs are noticeably thick! There is a lot of rubber used on the Gemini outsole, with the conventional division of harder rubber in heel and blown rubber on forefoot. The design lines and geometry are similar to what we saw on the Apollo, except that all contact points are covered with rubber. The lugs are fairly thick too, and it impacts durability. 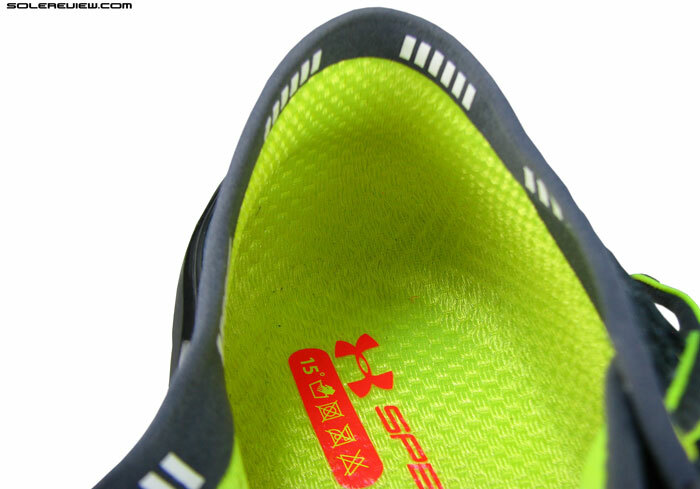 Going by the level of wear we saw after the first few runs, we’d place the UA rubber slightly above what a brand like Brooks might use. Midsole firmness and generous use of outsole rubber brings up the weight to around 314 gms/11 Oz for a half pair of US 11. That would be the median for traditional neutral running shoes, which the Gemini happens to be. Midsole has a visible outwards flare, making it a stable base. The midsole density and flare gives the Gemini great stability and a very neutral stance, with no bias felt during runs. 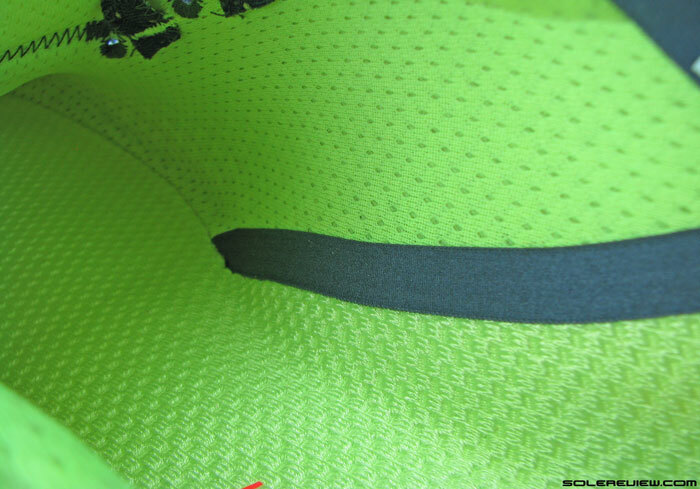 Compression is directly squarely at the heel center, no nervous see-sawing of the foam. It is important not to confuse our use of word ‘stability’ with traditional ‘stability’ shoes. That word is the footwear industry’s most abused term, which can mean anything from a shoe which is actually stable and firm, to a pronation control shoe with an aggressive lateral lean. 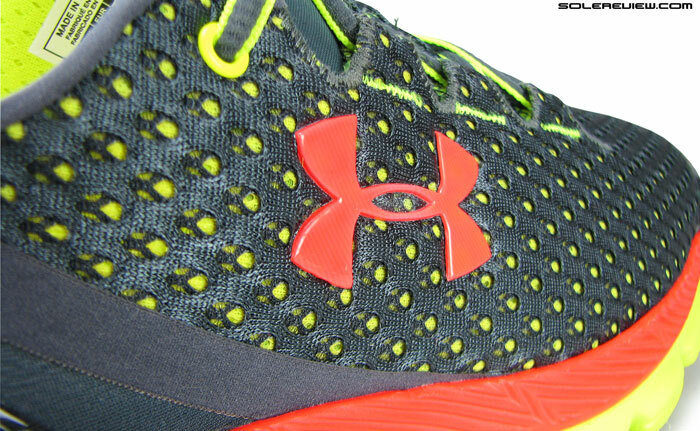 The Under Armour is stable because of a softer core surrounded by a firmer midsole casing, which helps keep the foot centered. We use the word stability in its literal sense, and not because the Gemini has some ‘stability’ device. If we had to name any other shoe which felt similar, that would be the Lunarglide 6 with its soft core inside a firmer base. Except that the Gemini does not feel as squishy as LG6, and we suspect that might be purely because of the lack of an insole. A Bemis or seam tape connects the front and rear parts of the Gemini’s upper. Molded heel counter of the Gemini – medial (inner) side. 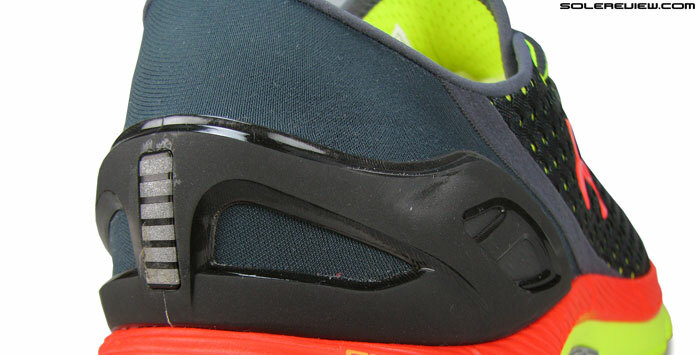 Molded heel counter of the Gemini – lateral (outer) side. The bar textured strip in the center is reflective. 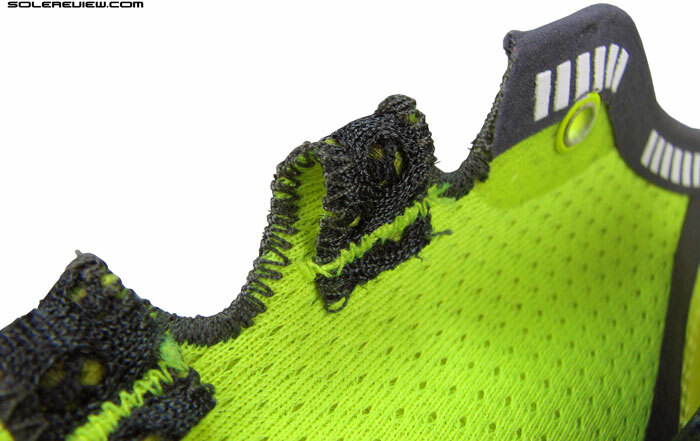 Reverse seamed collar has no foam padding, but has these grip strips on the inside edge. Gemini’s mesh. Is actually two different types of fabric fused together. The upper has design familiarity with last year’s Apollo. The minimalistic looking main upper is two piece; a larger panel in the front joined to the rear by a stitch free Bemis tape. There’s that molded plastic clip which wraps around the heel, and the collar edge is a thin strip with ‘grip strips’ fused on the inside. The inner rearfoot area has a seamless heel cup – a design element which debuted on the Apollo. Like the one on the outside, there is another strip of bemis tape connecting two sides of the inner lining. The mesh, while it looks like one composite material visually, is actually made of two meshes. The open pored type on the external upper, and that is fused to a second layer of softer inner lining. Very wide tongue, no gusset, but very little slide. Has a small amount of foam padding. Reflective detail on the forefoot. 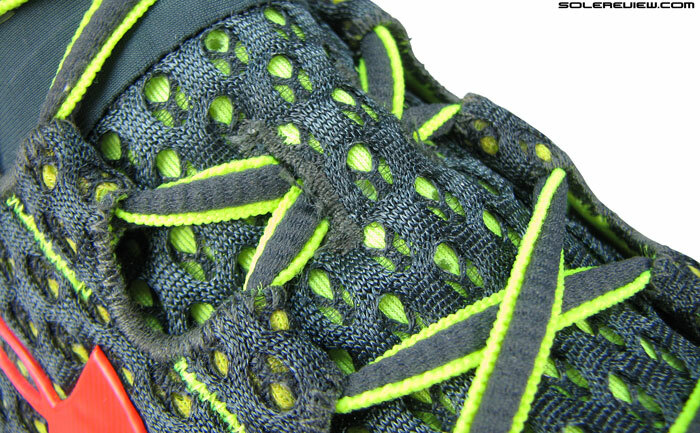 Lacing loops are formed out of the upper, making cinching more effective. 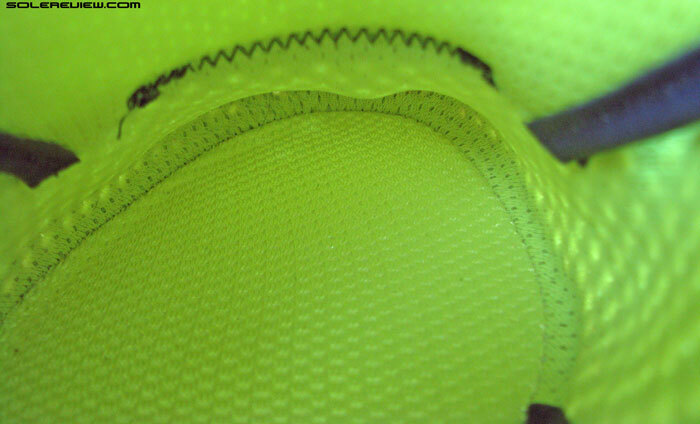 Top down lacing pressure is well distributed over the foot, no pressure spots. Tongue is wide and carries forward the slanted flap design – something which helps reduce tongue slide. Lacing passes through speed loops which are part of the mesh upper, and compared to the Apollo, the opposite ends of the laces are closer in distance – hence reducing top down pressure. 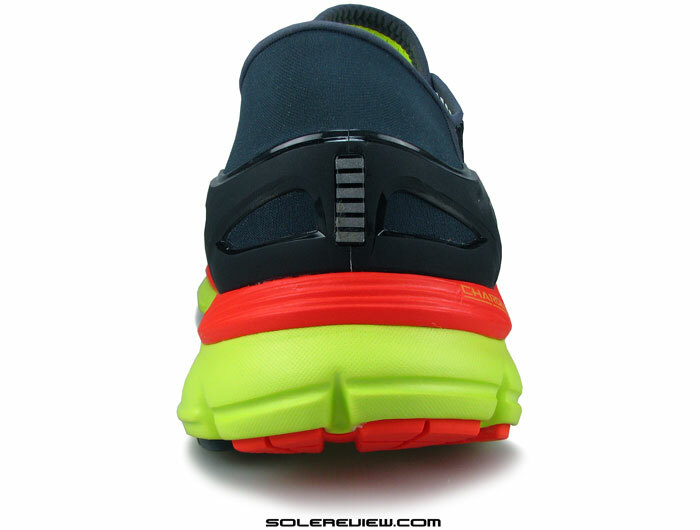 Reflectivity is placed in three places; bar shaped strips right at the start of forefoot lacing; an insert on lateral midfoot, and finally, a stack of bar strips on the heel. The toe bumper looks super low, but isn’t as bad as it looks. The actual footbed sits slightly recessed in relation to the red midsole edge. When viewed from the side, the Gemini’s upper silhouette looks very tapered, with the flat nosed front appearing to be extremely shallow. It is not as bad as it looks; while the toe box is shallow and compressively snug, it is no more so than say, a pair of Nike Pegasus 31. The reason for this is that actual level of toe-bed is lower than the midsole edges on the outside. So the foot sits slightly recessed in relation to outer midsole; but this doesn’t take away the fact that the Gemini is very snug fitting. The front is still quite snug, or form fitting, if you will. The mesh presses down over the big toe, and there’s side pressure over the forefoot. Particularly over the small toe, which is pinned down by the upper, in a very Hoka kind of way. It is also clear that the forefoot midsole design still needs some improvement; part of the small toe tends to be directly over the edge of the midsole. View from the top, and the lateral forefoot has a wee bit of an overhang. Fortunately, the midsole foam is soft and does not lead to discomfort, but yet you come away with the feeling that the could have been better designed. Two halves of inner lining are joined by another strip of Bemis tape. Tongue has a slanted flap, similar to the SF Apollo. A close-up of the grip strip on heel collar. 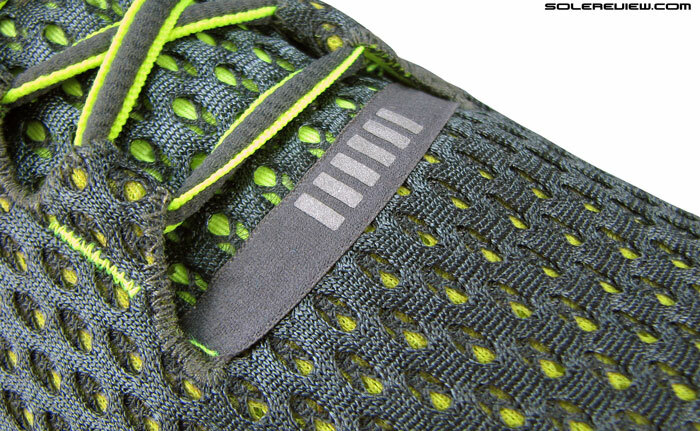 If you’re wearing the Gemini barefoot, the collar edges aren’t exactly comfortable, as they rub against your skin. Barring the laterally tight forefoot, there is consistency in fit through the upper. Midfoot has the right amount of snugness and under-arch wrap, the wide tongue goes over the foot nicely and does not slide. The lacing top down pressure feels right, with no hotspots. 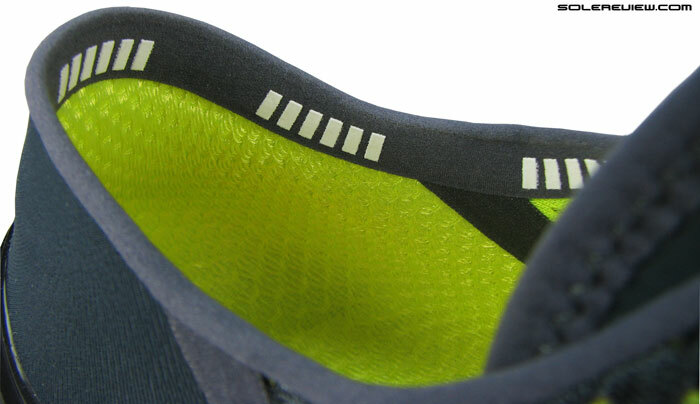 Heel collar, despite lacking traditional foam padding, performs a form-fitting wrap around the foot, helped in some measure by the grip-strips too. The seamless heel cup is functional as it is aesthetically pleasing, the absence of seams leading to incredible interior smoothness. However, note that in case of barefoot use, the collar edges tend to rub against the skin. Expect some break-in time if you’re planning to go no-socks on the Gemini. The shallow toe box would call for a half up size for most, though there might be some cases in which you’ll find the Gemini run true to size. If you want to err on the side of caution, buy half size bigger, but if you want to be dead sure, try them at the local store first. If you find the Speedform Gemini sizing to your liking, chances are everything else will be smooth sailing. 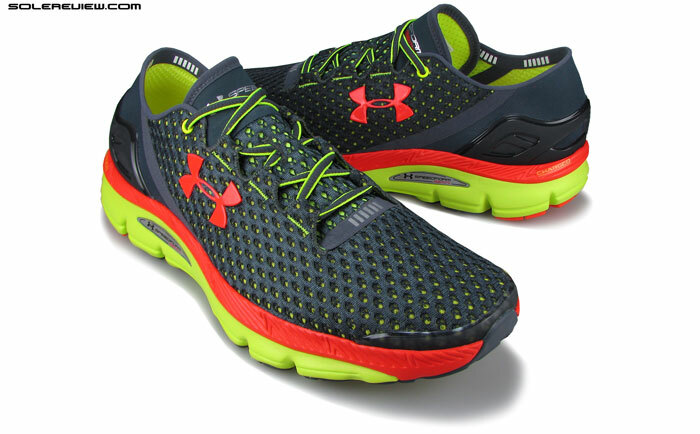 Under Armour’s done a stellar job here, by producing a neutral riding shoe which melds cushioning, responsiveness and stability in balanced doses. Great all purpose running shoe, whether you’re in for shorter comfort runs, distance running or for pace workouts. Don’t know what exactly goes (we trawled patent databases in vain) into the making of the new midsole foam, but whatever it is, it happens to be darned good. By the way, when looking for patents, we found this. It really depends on how much leeway you want in the front. The Gemini fits pretty much the same as Apollo, except that there’s increased mesh pressure on the toe-box. Personally, we would stick to a 10.5 US on the Gemini. Just thinking about it the Techfit upper on the Adistar Boost is fairly snug but doesn’t bother me at all so a 10.5 US is probably right. IMHO, that’s kind of goofball logic from UA on the whole pronation issue. A topic like this can debated from both sides for hours. But we side with UA’s logic based on our own experience testing not only running shoes, but across multiple field sports footwear as well. I really meant that regarding what type of company UA is trying to be. Are they ceeding the recreational runner demo to Brooks/Asics etc? They just don’t seem serious. Like they are trying to be the worst of what people think of Nike. Sorry I’ll be quiet now. Whatever their intentions are, it will surely take time. Regular production creation cycle is 18 months, and more if you’re planning to get in newness to compete. We’d estimate UA currently takes 24 months to bring a concept to life. An interesting write-up, thank you. I noticed the references to the Adidas Tempo 7 Boost – have you got a review of those coming up? Please see our upcoming reviews section (right at the top) for a rough schedule. Yes, I saw the tab, but when I open it I can only see a blank schedule – just dates, no reviews! I suppose it is my browser, but I can’t see how to unmask the review dates. Sorry. Strange, the calendar is populated with visibility till June, Are you using some kind of adblock? The Tempo 7 Boost will be in first week March. Thanks. I look forward to it. I am very impressed by the thoroughness of your reviews. How would you compare this shoe to the Pegasus 31? I currently run in the Pegs and considered getting a pair of these as well. I tried the Flyknit Lunar 2 but it didn’t work for me so I was wondering if the foam by Nike didn’t work would something like this be an improvement or a different feel to it? I am also considering the Adidas Ultra Boost to which I am waiting for your review next month for. I really enjoy your reviews, keep up the great work. 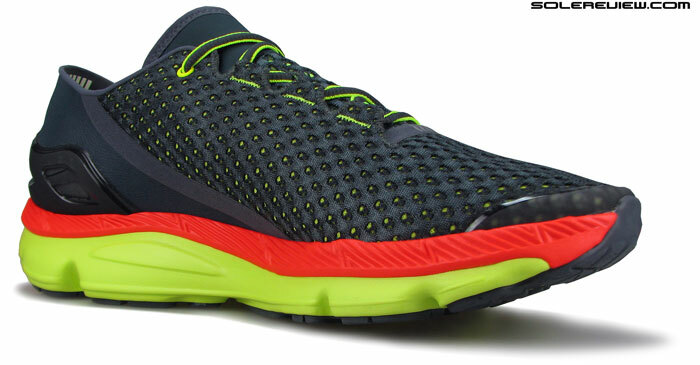 The Pegasus 31 has mushier cushioning compared to Gemini, and a more relaxed upper fit – especially in the forefoot. But we did not understand what exactly did not work for you on the Lunar. if you are specific, it can help us respond better. Yes, the Ultra Boost review should be up next month! The Lunar was always too stiff, they never seem to break in properly even after 70 miles. I supinate and so far the only shoe that has worked is the Pegasus. I wanted to give these a try or some other shoe but if the Pegasus 31 is working then maybe I should stick to it until it stops working. Thanks for the feedback. Yes, agree – if the Pegasus 31 is working for you, then we see no reason why you should switch. I’m really confused – you rate the shoe highly for stability, but state it is a neutral shoe. Does the stability come from the midsole’s firmness only (as there appears to be no other anti-pronation systems built-in)? 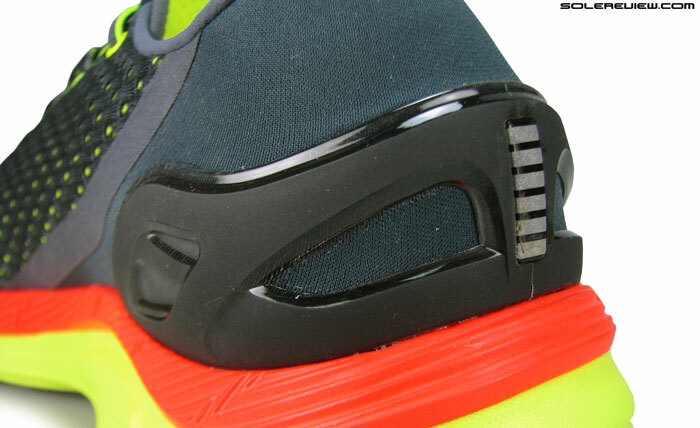 And the plastic external heel cup – is this a flimsy gimmick as per Kayano’s collapsible one? One final question – I run In Wave Inspires and find they offer the level of stability I need. You rated the Inspire lower for stability than this “neutral” shoe (as per the “sensory scorecard” graphs for both shoes). Would this shoe offer me similar or higher levels of stability than my Inspires? The key here is separate the word ‘stability’ and ‘stability/support/guidance/motion control’ shoes. We use stability in its literal sense, and you’re right, this comes from the inherent firmness of the Gemini, thus its ability to deliver a bias/lean free ride. Our ratings/scores are often questioned in comments, so here’s a quick primer on our behind the scenes. Many might not agree with our methodology and opinion offered, but there is a solid rationale behind our workings. This also covers what we include while rating stability, which in turn adds up to the total % score. A shoe with pronation control elements such as a medial post or similar feature might not necessarily be a good indicator of how stable the shoe actually is. Let us give you an example. The NB 860 V5 and Nike Zoom Structure 17 might be commercially generalized as ‘stability’ shoes, but they are actually not. Both these shoes exhibit a high level of motion control/lateral heel bias which robs it of stability. We did not understand your question about the heel counters – the Kayano’s is molded and non-collapsible, as is UA Gemini’s. Can you please rephrase? For the same reason, we find the Inspire’s heel to be slightly less stable than Gemini’s. But again, we don’t know whether you’re referring to the Inspire’s ‘stability’ from a pronation control sense, or true stability perspective. I had a pair of Kayano 20s but the bendable plastic external heel counter allowed my medial heel to roll off the inside of the shoe’s platform. I could bend the heel counter laterally easily with my thumb, hence my comment re it being “flimsy”. But the Kayano has a pretty soft squishy heel, and this shoe perhaps doesn’t? I think I’m referring to “stability” in a different sense than your reviews. I’m referring to the shoe’s over-pronation control in the traditional sense, such as medial heel posts/reinforcement. However, I take your point re. stability being about more than just anti-pronation devices. I think I will check-out the UA Gemini based on your review – sounds like it might suit me well. Thanks again for the most detailed reviews around. Yes, the Gemini’s heel counter is pretty solid and definitely non collapsible. Review is spot on. I have a pair of the Geminis and I really like them (almost love them) except for the pressure on the little toes. It is driving me insane. I have tried really cushioned socks and really thin socks nothing seems to work. (Can’t go sockless as of yet it is in the 20’s outside.) Wonder if cutting the mess a little over the toe would help alleviate some of the pressure? Anybody with any thoughts. Anyway great review….keep up the good work. Thanks for the feedback. Can’t really think of a way to make the pressure go away unless you go half size up, which comes with its own drawbacks like increased weight and less than ideal fit. Went a 1/2 size up and it didn’t help. Have tried super thin socks and that helps some, but after about 12 miles I can really feel the pressure on my little toes. Thanks for the reply and keep up the good work. That’s a pity, because the Gemini is beautiful. Sorry to hear it didn’t work out. Ok so I found a solution (for me) for the toe pressure issue. I found some socks made by Champion that are super thin and this seems to help. Any socks with normal padding puts to much pressure on the pinky toes. In all of this though I have found that the NB Borocay is a much better shoe me. Yeah, I realised that after I asked. 🙂 I had a test run with it, it’s a lot harder than the Boracay and Ultra Boost. Thanks for the tip, and agree, the Boracay has far more room. The heel collar seems to be cut so low compared to other shoes. It almost looks like your heel would be slipping out of the shoe if you didn’t have a tight fit. Does the shoe hold your foot well enough? Thank you. It does hold the foot well. They look look low cut, but measure them, and they do pretty ok. Here are some sample measurements of heel height dimensions across models. We’re measuring back collar height (B), lateral collar (L) and medial collar height (M) for a US 11. 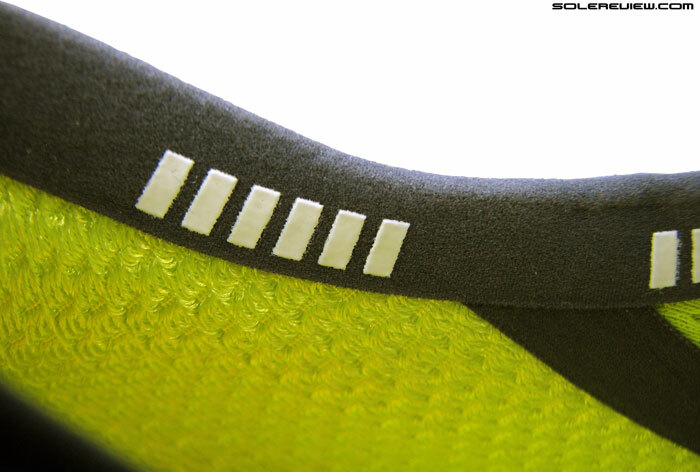 This is the distance between the insole surface and lowest collar point on B/L/M. See? Not bad at all. The Tempo 7 Boost is the one you should be really scared of. Thanks, great information! Pretty much in line with everything else. Not sure why the photo looks like that to me, but I think I just need to visit a LRS and see them in person. Yes, no substitute for getting yourself fitted at the LRS and see how they feel! I wanted to like these shoes, but I did find the back, where the rubber strips are to be uncomfortable. I am worried this will irritate my heal. I was planning to return these sites today. Sorry to hear that, because the shoe worked great for us. I run now with nike pegasus 31 (11 US) with orthopedic insole. is it possible to put orthopedic insoles in these shoes? which size should I predict for this model? they will be more dynamic? Hi! Nice to have you visit us all the way from France! 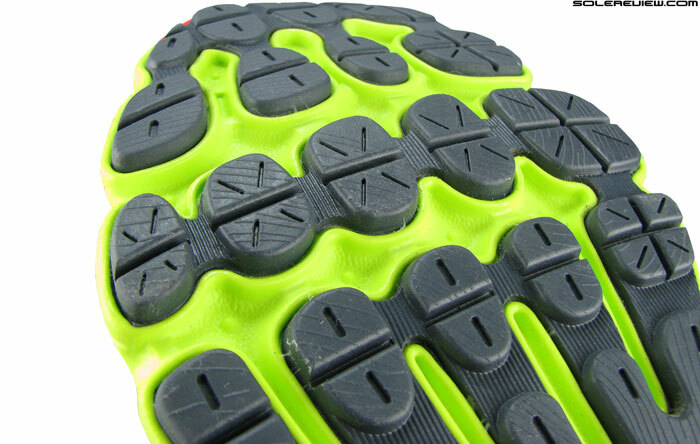 1) Orthopedic insoles cannot be put inside the Gemini, it will make the upper too tight. But then, 2) and 3) does not matter if 1) does not pass, right? You’ve mentioned you use aftermarket insoles, which this shoe cannot take. Try the Nike Lunar Launch if your orthotics are not very thick. Also, is this shoe okay for someone like me whose making a comeback in running? I stopped running two years ago and I really want to go back. The Gemini does far better (than the Apollo) when it comes to longer distances. Has the right mix of cushioning and stability. It will be okay for you to wear, but we hope you plan to include body conditioning/strengthening exercises along with your running. Shoes are a small part of the equation. Don’t go too fast/far too soon, gradually build your mileage and pace, and you should be all set. Thanks a lot! One more question though. Will the Gemini cause an issue with regards to runners having narrow or wide feet? Yes, the shoe upper runs tight, so might be an issue for some runners with wide feet. First off this site is awesome! I ran (pun intended) across your site a few days ago and I’m thoroughly impressed. Second, I was hoping you would help me out. I currently run in Brooks (long time brooks runner) Transcends with no problems very comfortable. I’m 5’10” 180 and I do have slight probation on my right foot. I’m very interested in these shoes are they comparable to the transcends? I like a soft shoe. I’m also interested in the Transcend 2s thoughts? appreciate the comment and the kind words! The Gemini runs firmer than the Transcend. With the Transcend, there is only one layer of midsole material and that’s fairly soft so you get that plush ride beneath. On the Gemini, there is a firmer layer of midsole below the softer part. The upper fit on the Gemini feels better, though the snugness will be familiar when coming from a Transcend. Our advice would be to stick to the Transcend. We’ll be reviewing the T-2 later this month, but our first impression is that delivers a similar ride to the first version. No idea at all, the Paradigm is not yet reviewed here! Only you can answer that. 🙂 It primarily depends on you, your body condition and running form. If you’re in a perfect condition with optimal running mechanics you might not face any issue. The Gemini is a very different shoe from the Kayano 20 (and presumably Noosa too). It has a shallower toe box with a firmer ride, compared to K-20. And like Sash says in his comment below, it is hard to know how the Gemini will perform for you long term, unless you put around 20-30 miles on it. All we say that is a great shoe, with the firm ride and shallow toe box being variables based on individual preferences. First run today in the gemini, and I have to say that the review is right on the spot. For me, this is possibly the shoe of the year. The cushioning albeit slightly firm was perfect for me. In the review it was mentioned that the midsole feels between the kinvara and the glide boost and agree. Thanks for the detailed review, this is my go to site prior to purchasing a new shoe. Thank you for the feedback. Happy to hear that you like what we put out there! Hi Ali, are you facing any difficulties/discomfort while wearing the Flyknit Max? If not, we don’t see a reason to change the shoe. If you want something more supportive, then try the Nike Zoom Structure 18 or the adidas Supernova Sequence 7 (or 8) Boost. Hi solereview, thanks for your reply. Yup, I’m facing discomfort (mostly at the middle part of the foot) every time I’m running with the Flyknit Max. Compared this UA Gemini and Saucony Hurricane ISO and Asics Kayano 21, which one do you guys recommend for flat foot? It’s hard for me to ask the sales person here as they are mostly promoting their products. Out of the three, the firmest (and most stable/supportive) would be the Saucony Hurricane ISO, followed by the Gemini and the Kayano 21. Flat foot doesn’t necessarily need be paired with a ‘stability’ shoe, but instead look for whatever feels comfortable and fits right. Hello there, I’m Syazwan from Singapore. I love this extensive review that you have done. Currently i’m intending to change to a new pair of shoes and caught up between Puma Ignite and Under Armour’s Speedform Gemini. I do alot of sprints which means alot of pounding. The neutrality of UA’s Gemini seems good and Puma as always is known for lightweight and speed just like the world-record holder. Please enlighten me, thank you! We’d recommend the Speedform Gemini. The upper fit is snug and conducive for fast runs, and the midsole foam feels very efficient. Thank you for the recommendation, i have considered the Speedform Gemini as well. The Boracay feels slightly softer than the Gemini, and the upper forefoot more roomy. For a easy run cruiser, we’d recommend the Saucony Ride, Nike Vomero 10, and New Balance 890 V5 as options you could try. Hopefully you should be able to find these in shop stocks and hence have an opportunity to personally try before buying. The reason why we don’t suggest the Gemini because the ride is a bit firm, and the upper fit snug – these might get in the way of simply cruising around. Would have suggested the adidas Glide 7 Boost too if it weren’t for the plastic midfoot shank. Ok, thanks a lot! Then I think i won´t opt for the Gemini when it is slightly firmer than the Boracay since my other shoes are all faster with much less weight without being too harsh for my feet. I always thought about the Saucony Ride, but didn´t run them as i was quite happy with the Kinvara and saw no use for the Ride (for me maybe the Zealot would be worth a try). I think i will try out the Nike Vomero 10 based on your good review, i really like the new upper constructions of their new 2015 models! One last question: is there any chance that you will review the NB Vazee Rush ? Seems to be a more comfy version of the NB Vazee Pace, which i will definitely give a go. You’re welcome! Hopefully you will like the Vomero, we love that shoe here. We will eventually review the Vazee Pace/Rush/Coast, just not sure when. We’ve got at least 15 more (other) shoes to finish reviewing before we can get to the Vazee series. Great in-depth review. 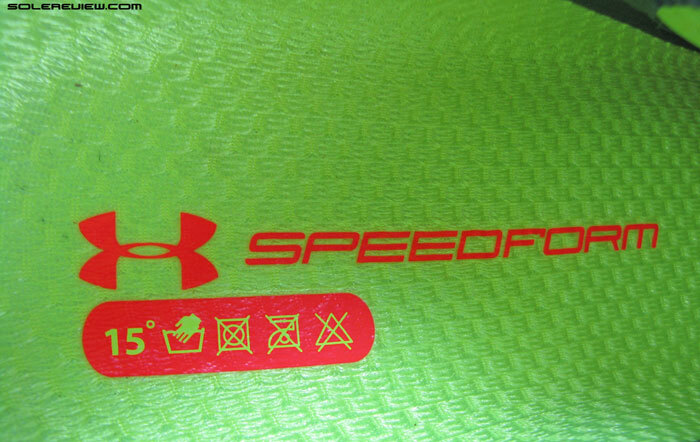 Will you be reviewing the Speedform Fortis? Likely, but can’t say when. Hi guys, great review. I am currently running in Saucony’s (Kinvara) and have been looking at these for awhile now. I know that the kinvara’s are more of a midfoot strike in terms of biomechanics, so how do the gemini’s compare? I saw that it was an 8mm drop whereas my shoes now are at a 4mm. Would this be an issue if I were to get these shoes as my primary running shoes? I like the feel of the different striking pattern as it’s really helped out my knee issues but I am always open to try new techniques and shoes for that matter. Thanks! The Gemini’s outsole geometry makes it suitable for all footstrike types. But whether you like them or not is entirely subjective; only one way to find out, and that’s to use them for at least a week. If the Gemini felt nice, go for them. 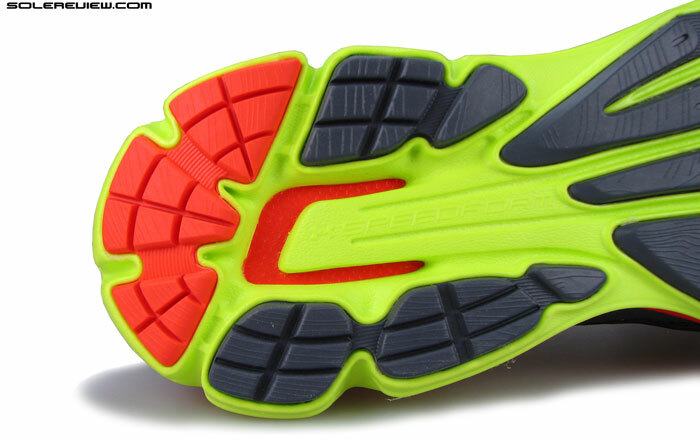 Also try the Vomero 10, which is softer than the Gemini but has a wider forefoot. I’m on my second pair of the original Speedform Gemini and still think are some of the finest running shoes ever made. Are there any future plans to review the Speedform Gemini 2 and future Speedform Slingshot? Thanks for the suggestion, but no plans for now, no time/budget. For easy runs around 8:00 minute mile pace with would you recommend the gemini or the saucony triumph iso 2? What are the similarities/ differences between the 2? Thanks for the in depth reviews! The ISO 2 would be better suited for easy runs. The Gemini is much firmer, and has a narrower upper. The similarity stops at both the shoes being in the same neutral category.